Work From Home Warnings Flip My Binary Account: It’s a Flippin’ Scam! Flip My Binary Account: It’s a Flippin’ Scam! The Good / Arguably, it is an slightly more ingenious approach to taking your money. The Bad / Unfortunately, it's just another approach to taking your money. My Recommendation / There's no reason why non-binary account holders would buy an already existent binary account. This is just a scam to take your money. 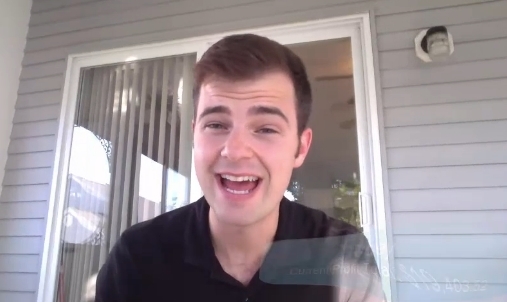 Stick with our #1 recommendation if you want to learn how to build a real business online. Binary options scammers make up all kinds of stories to hook you in. Some scammers pretend to be oiligarchs. Other scammers spin tales about affairs and death threats. The list goes on and on. And speaking of which, here’s the next story line to hit the binary options circuit: Flip My Binary Account. What is Flip My Binary Account? 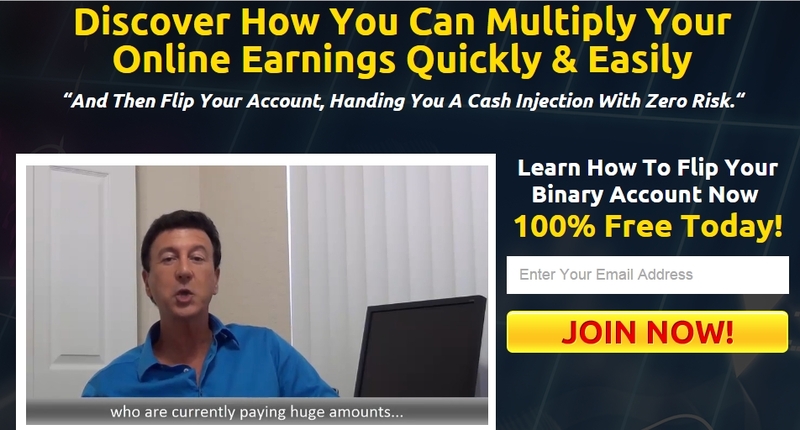 Ronald Green has a proven method for making tons of cash using binary options accounts. In sum, Ronald’s method involves flipping already established binary options accounts to willing buyers. Using this system, Ronald has earned over $737,700.71 in just the last two months. And now, you can too. 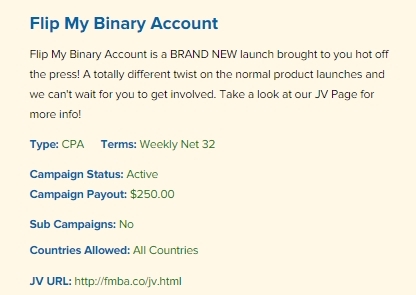 How does Flip My Binary Account work? Ronald, the CEO of Flip My Binary Account, explains that he will “teach you a strategy how to create a binary options account and then flip it…to another person for huge profits.” Ronald adds that, at this moment, there are thousands of wealthy individuals who are eager to purchase your binary options account “via a little known bidding site just like eBay.” These buyers are looking for an account that shows consistent growth, much like any other business. 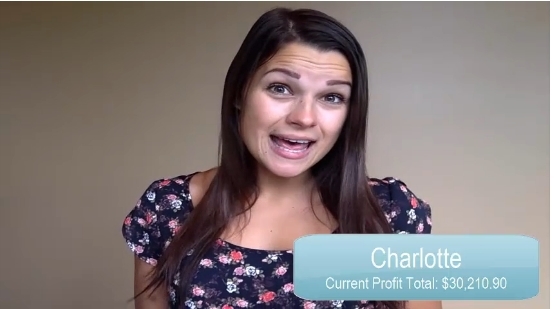 In other words, your binary options account is just like a business that you can buy and sell- and thus profit from. But why would buyers be looking to buy an already established account when they could just as easily open a new account? We’ve heard about these auto-pilot income producers before. And we’ve also learned that “make money while you sleep” systems are almost always pure scams. Why am I skeptical of Flip My Binary Account? Reason #1: The testimonials are generated by actors. 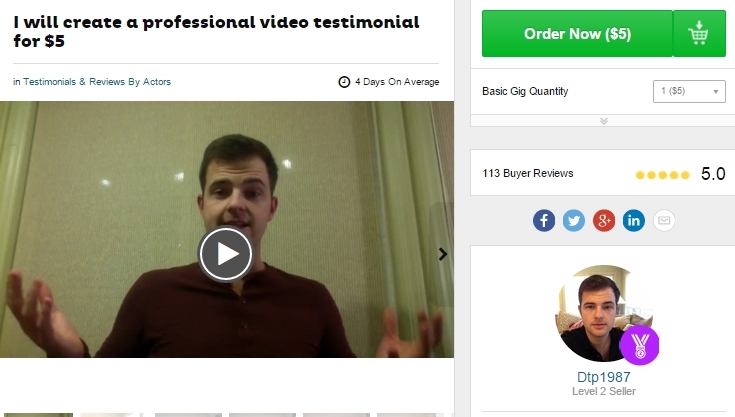 The problem with every one of these testimonials is that they are generated by paid actors- specifically, actors that can be hired at $5/pop on Fiverr. Reason #2: Ronald Green doesn’t exist. I looked up Ronald on LinkedIn, Facebook, Twitter and Google. I tried several different business listings, including Dun & Bradstreet. Ronald either doesn’t exist, or his name is too common to pick up when searched with Flip My Binary Domain. Reason #3: Flip My Binary Account is listed on Clicksure. Clicksure is an affiliate network well known for hosting many scam products that don’t make it to more reputable places like Clickbank. Flip My Binary Account is listed on Clicksure. As a result, most, if not all, of the positive reviews of this product contain affiliate links. And who wouldn’t sing the praises of this product when the reward is a $250 commission? Reason #4: You need to open and fund a binary options account. The main objective of any binary options scam is to have you sign up for a new trading account so that the scammer makes a commission from the brokerage. 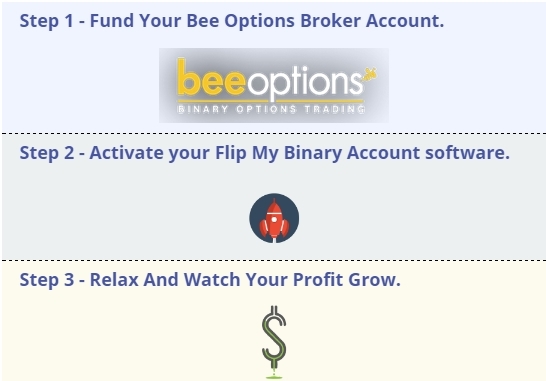 In my case, I needed to create a new trading account with Bee Options. There was no mention of trading strategy or a members’ forum when I went to Bee Options. There was only the deposit page of the brokerage. Incidentally, the minimum investment amount to open an account was not $250, or even $500, but a whopping $600. Reason #5: The strategy doesn’t seem realistic. I don’t know about you, but it seems unrealistic to me that wealthy people would not know how to open a binary options account, and that they would rely on you to take this critical first step. Opening a new account is just not that difficult. Also, because a binary options trading account is linked to a bank account or credit card, it just can’t be transferred like a website or some item on eBay. In fact, legitimate trading platforms like eTrade go to great lengths to confirm your identity and ensure that you’re not using someone else’s bank account or financial information. Most trading platforms will also ask if you are subject to IRS withholding and require your social security number. Thus, transferring an account to someone else would be difficult if not impossible. Finally, how would a person make money from your binary options account anyway? You need an active trader to make money through binary options trading. An account will not just automatically make money. Summary: Flip My Binary Domain is a scam. The fake testimonials, lack of concrete proof of a members’ forum, as well as the listing of this product on Clicksure all point to Flip My Binary Account being a scam. Thanks for the information. It was great that you showed “how” you determined this was a scam. Now people can see it is not that hard to discover if someone or something is the read deal (or at least not an obvious scam). Great work!